One very useful tool – and a necessity – in trekking is the good old swiss army knife. With just one compact and handy device, one can have the power to chop veggies, open cans, bend wire, and pick teeth. With the more fancy swiss army knives, one can even saw through wood, have a pair of scissors to cut paper and cardboard with, open a bottle of wine, twist a loose screw into place, and a lot more. This gadget is the ultimate tool for the mobile handyman. In fact, you don’t have to be a mountaineering enthusiast to find the swiss army knife a necessity; you can do lots of things with it even at home. The Victorinox swiss army knife has even evolved over time, with models featuring thumb drives. Nice, eh? My Victorinox swiss army knife was a gift from a good friend in the late 90s (around 1997). It has been with me for around 10 years now and when I use the knife, I simply wash it with water and wipe it dry. And the knife is still as sharp as ever! 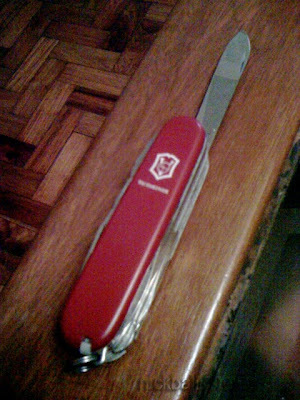 This is a firm testament to the quality of the Victorinox Swiss Army knife for its durability and usefulness. And when I use it, it reminds me of my good friend Bong when he gave it those many years ago. What a wonderful gift!